Roy Clark, 'Hee Haw' Host And Country Music Ambassador, Dies At 85 The singer and multi-instrumentalist, known for his fleet guitar work and big smile, began his career as a teenage prodigy and rose to become a regular presence in the living rooms of America. 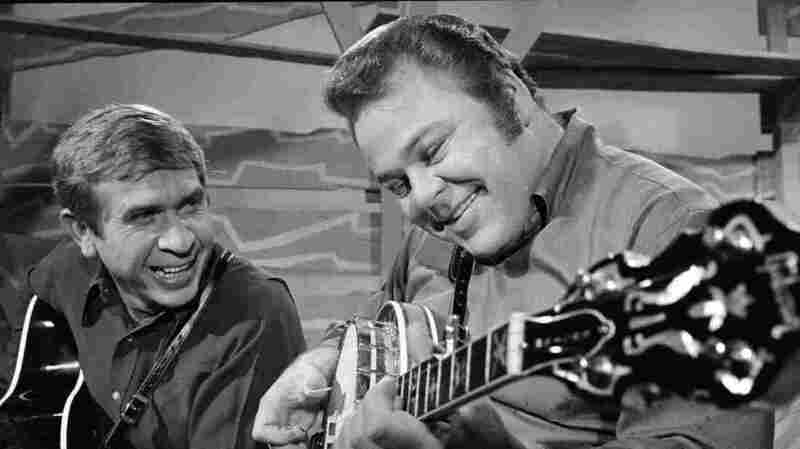 Hee Haw co-hosts Roy Clark (right) and Buck Owens in 1969. Clark died Thursday at the age of 85. He was 85 years old and died Thursday at his home in Tulsa, Okla., of complications from pneumonia. His death was announced in a statement from his publicists. Clark became something of an ambassador for country music, not just in the U.S. but internationally, appearing in locales as far-flung as the Soviet Union, where he did a groundbreaking tour in 1976. He also helped turn the Ozark town of Branson, Mo., into an entertainment hot spot for Americans after opening the Roy Clark Celebrity Theatre there in 1983. Born Roy Linwood Clark on April 15, 1933, in Meherrin, Va., he grew up mostly in Washington, D.C., and gained a love of all kinds of music early on. His father, who played in a square dance band, took him to see the National Symphony Orchestra and military bands. A remarkably talented multi-instrumentalist, Clark started out on the banjo and mandolin; when he was 14, he received his first guitar as a Christmas present — and made his first television appearance that same year. First performing alongside his father, he began playing in D.C. bars and clubs, ignoring his schoolwork to the point of dropping out at age 15 and soon going on tour with the likes of Hank Williams. He was first invited to the Grand Ole Opry as a teenager, after winning a national banjo competition in 1950. While he was first and foremost a country artist, Clark was something of a polymath, with facility in rock, jazz and pop; he became the first country artist to play at the Montreux Jazz Festival and recorded an album with jazz artist Joe Pass in 1994. In the mid-'50s, Clark honed his television chops as a regular on Country Style, the D.C.-based television show hosted by Jimmy Dean, eventually taking over as host after Dean relocated to New York. But Clark hit his big break in 1960, when he was invited to Las Vegas to open for country artist Wanda Jackson. After the dissolution of Jackson's band, Clark savvily hired her old manager, who secured him appearances on The Tonight Show and Beverly Hillbillies. His first album, 1962's The Lightning Fingers of Roy Clark, was soon followed by his first hit single, "The Tips of My Fingers," the next year. In 1969, his song "Yesterday, When I Was Young" became a hit on both the pop and country music charts; other major hits included "Come Live with Me" in 1973 and "Somewhere Between Love and Tomorrow." With seven nominations throughout his career, Clark's recording of "Alabama Jubilee" won a Grammy Award in 1982. In 2016, Clark told NPR's Weekend Edition that Hee Haw was something that many Americans could relate to, regardless of local culture — and even as network executives and critics derided the show. "I was just in New York City," he said, "I was walking down the street and the guy yells across and says, 'Hey, Roy, I'm a-picking.' Well, I'm obligated to say, 'Well, I'm a-grinning.' " And the show helped make pop culture stars out of the likes of Merle Haggard, Loretta Lynn and Tammy Wynette. Moreover, the show helped make country music into a mainstream phenomenon, as Clark wrote for the Huffington Post in 2015: "First and foremost, I am most proud of how Hee Haw did its part to help pave the way for country music to burst from its regional roots to remarkable worldwide popularity."